RIKKI SANTER WANTS YOU "To Make Me That Happy"! of making works-of-art books for poets across the United States! by one of Ohio's most gifted poets, Rikki Santer. 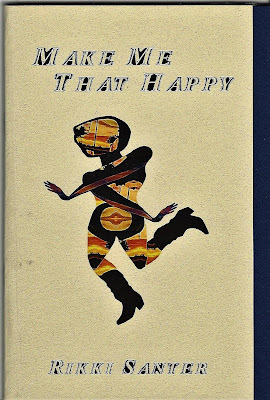 Make Me That Happy, with dynamic cover art ("Do-Si-Do 6.26.17") by Bree (www.theartistbree.com), is a full-length collection, containing 42 poems on 64 pages. This saddle-stitched book has a cover cardstock of warm tan, with a deep blue, textured, cardstock insert. The poems are printed on bright white paper. Santer writes about "Condiments as a Way of Knowing," about "Arguments for Furniture', about "Still Life with Whoopee Cushion," and "Taxidermy for Erotica." Her poems are dancers in a conga line, inviting the reader to join in the rhythm and kick, the joyful weaving of words, from the first page to the last! Rikki Santer has worked as a journalist, a magazine and book editor, co-founder and managing editor of an alternative city newspaper in Cleveland, and as poet-in-the-schools. She earned an M.A. degree in journalism from Kent State University, an an M.F.A. degree in creative writing from Ohio State University. Her work has won honors from The Poetry Forum, Black Lawrence Press, and the Ohio Poetry Association, as well as Pushcart and Ohioana Book Award nominations, and a fellowship from the National Endowment for the Humanities. Her work has appeared in Slipstream, Main Street Rag, The Atlanta Review, Rhino Literary Journal, and many others; previous books include Kahiki Redux (Wexner Center for the Arts, 2015), Fishing for Rabbits (Kattywompus Press, 2013). Clothesline Logic (Pudding House, 2009), and Front Nine (Kalupi Press, 2005). Santer lives in Columbus, Ohio. Find her at www.rikkisanter.com.